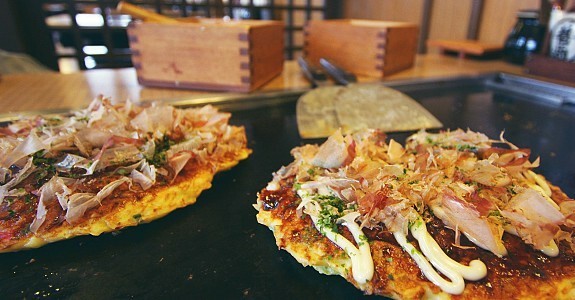 Okonomiyaki is a popular pan fried food that consists of batter and cabbage. 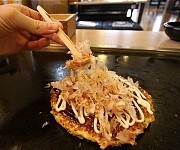 Selected toppings and ingredients are added which can vary greatly (anything from meat and seafood to wasabi and cheese). 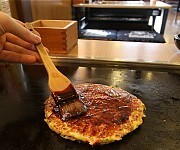 This variability is reflected in the dish's name; "okonomi" literally means "to one's liking". 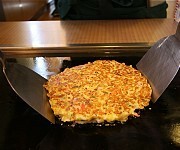 The dish is available all over Japan, but is most popular in the west, particularly the cities of Hiroshima and Osaka. 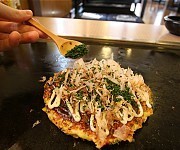 In Japan, people usually eat okonomiyaki at restaurants that specialize in the dish. 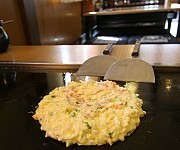 At some of these restaurants the dining tables are each equipped with an iron griddle ("teppan"), and customers are given the ingredients to cook the meal themselves. 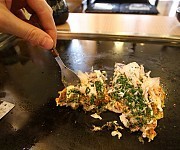 As this can be rather daunting, the stages of cooking are enumerated below. 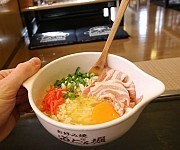 Information about regional variations can be found thereafter.